My business started in 2008 the day Mama Vuvuzela, a lost chicken, walked in our yard. She was named that because she seemed to rule our large farm dogs, Jesse, Milo and Toffee. I often saw Milo carrying Mama around and was so worried. I later learned that this was a game for Milo – perhaps not so much for Mama - and she would climb out of Milo’s mouth unharmed. We then bought 60 chickens and true to style, Mama took them under her wing and ruled them. My family all helped grow this business – my sons earned pocket money by feeding them and cleaning the coops. I packed the eggs to ensure quality and my husband delivered them after taking the children to school. Free range is really what these chickens are – the doors of the chicken coops open to the most stunning view of the Helderberg mountains and they are free to roam all over the 5 ha surrounding us. The coops are built above ground so that they can gather un derneath if it is hot or raining. Being a passionate Nutritionist, I supplement their grazing with all grain meal – carefully chosen to ensure optimal health. 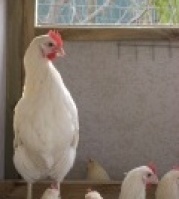 We have recently begun sprouting barley for additional supplements for the chickens in an effort to continue supplying a quality product at a competitive price. We started a nursery for chicks on the farm and many of our chickens are now living in Malmesbury and Hopefield on friends farms who is as passionate about them as I am. This venture has brought so much happiness into our lives. It is exciting to see how many people are now buying real free range eggs. As for the chickens – we often find eggs behind our front door or a stray chicken in the kitchen much to our delight and Mama Vuvuzela was the first one at the kitchen window in the mornings - waiting for her morning back scratch. Our boys have grown but still help by delivering eggs early in the mornings before School and University. Sylvia and Wiseman have joined our "family" and help keep the chickens happy. Just1: SA's most affordable DIY website builder!